Our Puppies are by AKC Registered Parents. 1. 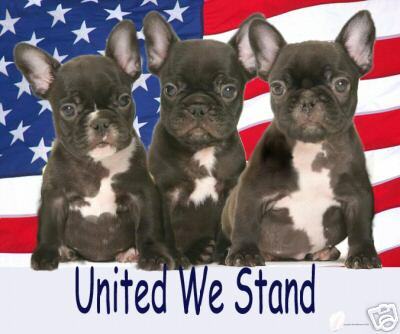 Give me a call at 540-436-9405 and lets talk about Frenchies before filling out the Application. I will be glad to answer all your questions. 2. Fill out my Application to get pre-approved. 3. I will email you to confirm that I received your Application. 4. Once you are approved you can get on the Pick-List by sending me a deposit that I will staple to your application. When puppies are born you will be notified and have a chance at the new puppies. Once you choose a puppy the deposit will be deposited on that puppy and your deposit will be non-refundable. At anytime you can request your check back if you don't choose a puppy. 5. Photos will be posted to the website and emailed to the people on the Pick-List. 6. Appointments will be scheduled when I say they are ready for visitors. 7. Once a deposit is put on a puppy the puppy is marked sold and a contract is signed. 8. Between 6 & 8 weeks I take the puppies to the Vet and will notify everyone who has a deposit on a puppy how they checked out and schedule pick-up. 9. Puppies usually are ready to go between 8 and 9 weeks of age. At pick-up bring cash to pay the balance, I do not except checks of any kind. 10. Keep in contact, you are now part of the family. Visit when you can and send photos and call or email anytime. 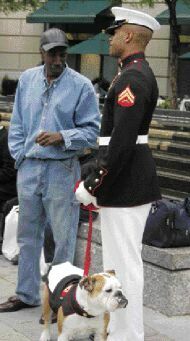 We are Proud Americans who greatly appreciate the US Military fighting to keep us free and safe. 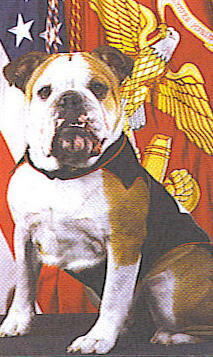 Chesty XII is by our late Bulldog stud, Bocephus!